Stamets trained as an astromycologist. Prior to the outbreak of the Federation-Klingon War in 2256, Stamets and his research partner, Straal, were working on an experimental propulsion technology known as the spore drive. This made use of prototaxites stellaviatori spores linked to the so-called mycelial network and could theoretically allow a starship to travel great distances instantaneously. Stamets and Straal worked on the project together for nearly twelve years, but failed to achieve decisive results. When the war started, Stamets and Straal were co-opted by Starfleet to develop military applications for the technology. Stamets and Straal were assigned to the Crossfield class starships USS Discovery and USS Glenn respectively, experimental vessels that were the first to be built around spore drive technology. While aboard the Discovery, Stamets shared quarters with his partner, Lieutenant Commander Doctor Hugh Culber. He was uncomfortable with his work being co-opted for military purposes, and regarded his commanding officer, Captain Gabriel Lorca, as a war monger. Despite six months of research, by late 2256 both the Discovery and the Glenn were still unable to make spore drive jumps greater than intervals of Speirin 12 for the former (a few hundred kilometers) and Speirein 240 for the latter. Stamets remained in regular correspondence with Straal, who by the end of the year was ready to consider a spore drive jump of Speirein 900, which Stamets felt was unsafe. At this time, Stamets met Michael Burnham after her disabled prison shuttle was rescued by the Discovery at Captain Lorca's direction. Despite being a convicted mutineer, Lorca assigned Burnham to work under Stamets in the hopes that her predictive mind and determination would help him make the spore drive viable. Initially affronted by this, Stamets was soon forced to confront other issues when a distress call was received from the USS Glenn. Stamets and Burnham were part of the team sent aboard to investigate, and discovered that the ship was a derelict with the entire crew having been severely mutilated, including Straal. Stamets deduced that the Glenn had been destroyed by an accident with its spore drive, and the team was soon ambushed by an immense creature. With the aid of Burnham, the creature was captured and brought aboard the Discovery. The creature was dubbed a "tardigrade" for its resemblance to the microscopic Earth creature. Soon nicknamed "Ripper" for its apparent aggression, Stamets soon realized that it was able to communicate with the mycelial network and that the Glenn had used it to improve its spore drive. Though initially reluctant to attempt the same process, Stamets was convinced by Lorca's appeal to his sense of scientific wonder. Linking the tardigrade into the spore drive while exposing it to prototaxites stellaviatori in the spore chamber transformed the creature into an organic navigation computer, and allowed the Discovery to make a long jump to halt a Klingon attack on the mining colony of Corvan II. Stamets had made the spore drive viable. Intensified development of the spore drive began on Earth while all Federation ships, starbases, and colonies were placed on alert to search for more tardigrades. However, forcing Ripper to act as a navigation computer caused it immense pain and it soon became obvious that each jump was severely debilitating to it. After Captain Lorca was taken prisoner by the Klingon Empire, repeated use of the spore drive in attempts to rescue him resulted in Ripper entering an extreme state of cryptobiosis and becoming unresponsive. It was subsequently released by Michael Burnham. Stamets was under pressure from the first officer, Commander Saru, to restore the spore drive. With the help of Cadet Sylvia Tilly, Stamets resorted to injecting himself with a sample of tardigrade DNA and entering the spore chamber to act as the navigation computer. The jump was a success and Lorca was recovered, along with another Starfleet prisoner, Lieutenant Ash Tyler. The exertion of the jump briefly knocked Stamets unconscious, but he recovered with apparently no ill effects. Events soon proved that Stamets' exposures to the mycelial network were changing him fundamentally: due to his mixing of tardigrade DNA during his usage of the spore drive, his consciousness came to exist outside the universe's normal flow of time. He began seeing flashes of what were later discovered to be events in the mirror universe, including images of mirror, and once briefly mistook Cadet Tilly as mirror. His crewmates, however, only noticed that his scientific success had caused more positive sides of his personality to emerge. His partial displacement in time meant that he was the only crewmember to notice when the Discovery was trapped in a repeating thirty-minute time loop created by the con man Harcourt Fenton Mudd. Mudd used the loop, generated with a time crystal, in an attempt to steal the Discovery and sell it to the Klingons; however he was unable to account for Stamets, who was able to alert the crew and foil Mudd's plan. To improve his connection to the spore drive, Stamets accepted cyborg augmentations to his arms. However, he was increasingly aware that use of the spore drive was taking its toll on his mind. He confided only in Cadet Tilly, refusing to tell Dr. Culber out of fear it would place his partner in emotional conflict over whether to alert the rest of Starfleet to his condition. While investigating the planet Pahvo, Captain Lorca saw an opportunity to destroy the Klingon starship Sarcophagus and develop a way to penetrate cloaking devices. To accomplish this Stamets would have to conduct 133 micro-jumps with the spore drive so the Discovery could gather data from multiple angles to generate the algorithm to penetrate the cloak. In the subsequent battle at Pahvo, the Discovery succeeded in destroying the Sarcophagus, killing the Klingon leader Kol and capturing L'Rell, who was believed to have tortured Ash Tyler while he was a prisoner. 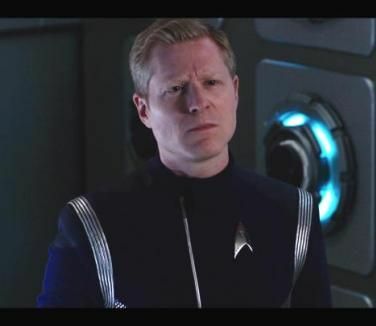 However, Stamets was visibly distressed from the effort of conducting so many jumps in such a short time, and declared to Lorca that he would conduct one last jump to get the Discovery to Starbase 88 before submitting himself to Starfleet Medical for evaluation. However, the man who the Discovery crew believed to be Captain Gabriel Lorca was in fact his mirror. This Lorca deliberately sabotaged the jump, using a theoretical application of the spore drive to take the Discovery into the mirror universe. The effect of this plunged Stamets into near-catatonia: his eyes became a blank white and when he spoke it appeared incoherent and delirious. Without Stamets, the Discovery had little chance of returning to the prime universe. Stamets' consciousness was in fact trapped in the mycelial network. Through that he still had some contact with the physical world, violently blurting out "Don't go to palace! ", and whispering "The enemy is here" in brief moments of lucidity. Dr. Culber saw this as insane rambling. However, while Stamets was still unconscious, Culber was murdered by the increasingly-unstable Lieutenant Ash Tyler. It was subsequently discovered that "Ash Tyler" was in fact the Klingon Voq, physically – and mentally – transformed into the real Tyler's form to act as a spy, and Voq's personality had been partially-awoken by the presence of L'Rell. Stamets remained aware of this though his mind remained disconnected from his body, and he was discovered in one of Discovery's corridors cradling Culber's corpse. Cadet Tilly compared Stamets' brain scans to those of the tardigrade, and discovered that Stamets' brain had developed a similar make up. Since the tardigrade had been cured before its release by exposure to the mycelial spores, Tilly reasoned that a similar treatment might improve Stamets' condition. Under such treatment, Stamets' physical signs improved across all biological metrics, though mentally he remained in the mycelial network. There he encountered his mirror counterpart, who had been working on similar experiments. Together they explored the "USS Stamets", an illusory starship created by the network from Stamets' memories, attempting to find a way out. They encountered a spreading corruption within the network, and fled into the "main engineering" of the illusion.